Themes of love, loyalty and self-sacrifice adorn Zhang Yimou’s follow up to the successful Hero. 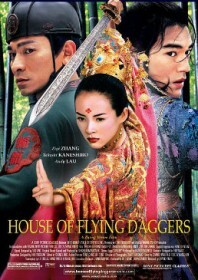 It’s hard to view House of Flying Daggers without drawing comparison, especially with Christopher Doyle returning to add his remarkable cinematography, and Tony Ching splashing a glossy CGI undercoat to his superb swordplay. Even gimmicks and cast members are recycled. Where it differs is in its melodrama which is sometimes too sentimental for its own good, acting as an emotive showcase for Zhang Ziyi. The soap opera soon gets tiresome and holds much less of an impact than the affectionate subtlety of Hero. The mood-shifting characters make it difficult to get too caught up in their actions. This is not to wholly discredit the film, because it looks wonderful. At one point, even Ziyi’s face seems to resemble some form of angelic portrait, woven into a background of soaring colour and costume. Two scenes stand out. The first is a dance routine in which Ziyi’s long, flowing sleeves bounce off a series of drums in a rhythmically challenging exchange of skill with Andy Lau. The second is a nod to King Hu with an almighty showdown in a bamboo forest. The narrative isn’t as inquisitive as Hero but does intertwine nicely with the action, rather than leapfrogging from one glorious set piece to the next. Ziyi plays a blind assassin working for famed female rebels the House of Flying Daggers, while Tang Dynasty officers Andy Lau and Takeshi Kaneshiro fall in love with her. It’s a lot more complicated than that, as you would expect, and involves the policemen’s ploys to use her as a means of finding the rest of the Flying Dagger cult, acting to divide their loyalties further. There is a more westernised, mainstream Hollywood sensibility to the film, which isn’t necessarily a bad thing, however Yimou’s previous wuxia spectacular certainly has the killer edge.